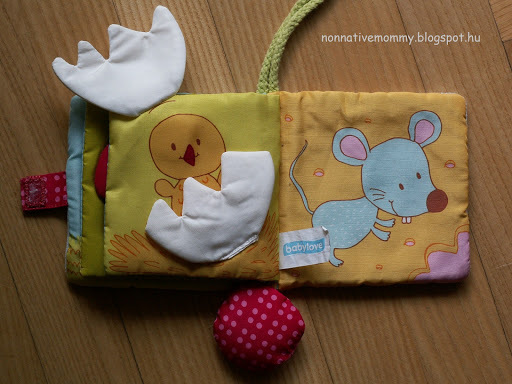 When E. was a baby I wanted to write a post about what books we are using every 6-12 months. I didn’t. I feel it as a pity so I got a second chance with Baby Sis. Here it comes. The books we’ve been using in L.’s first year. 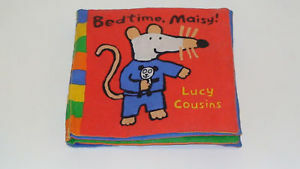 Maisy’s bedtime – We usually have a look at this booklet before bath time. 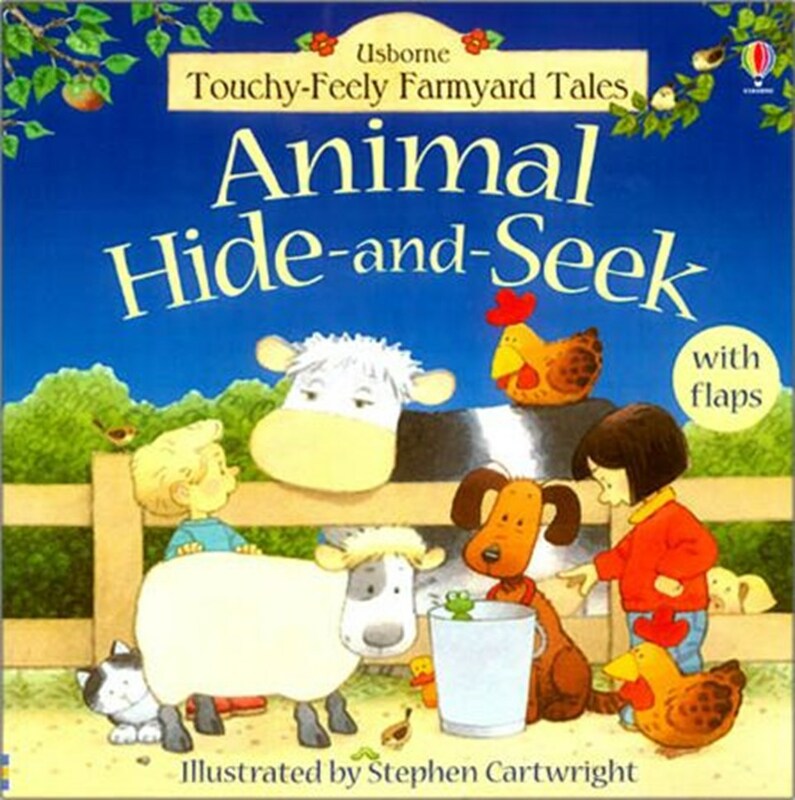 One of our favourites is this Animal hide-and-seek. You can see how fun it is in the video below. 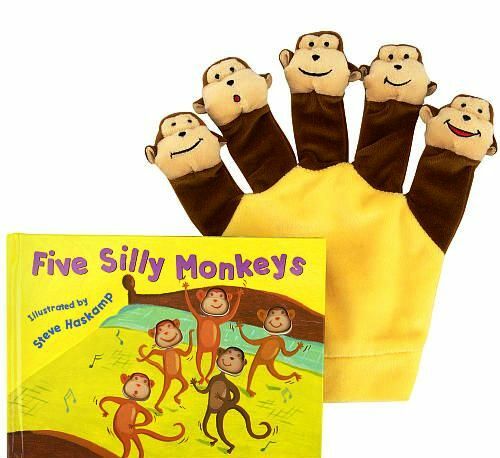 “This time five monkeys are silly and not just mischievous. They jump on the bed of course, then they eat on the bed, swing on the bed, slide on the bed, and then spin on the bed. L. loves to put her little finger through the holes. Sometimes a sing the original version. Sometimes with the funny activities like jumping,, swinging, sliding etc. 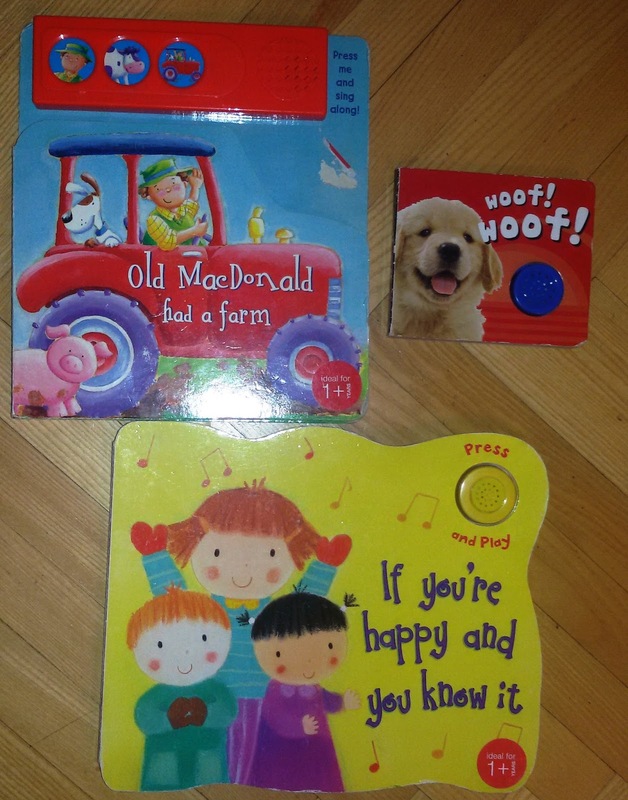 I hope you could find some ideas about what to read with your little one. Feel free to share what books you’re reading with this age group. Wow! 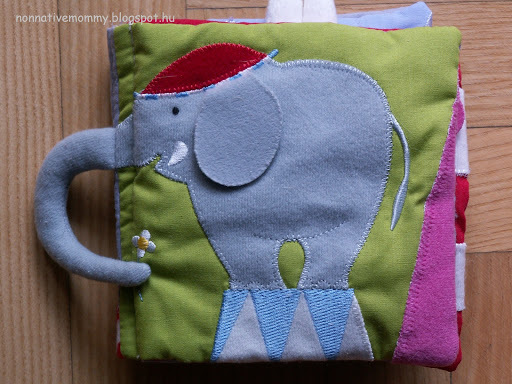 I’ve just found some old photos in which E was making a toy for Baby Sis out of some ribbons, the laundry basket and some other toys. Kids’ creativity knows not bounds. As there are some birthdays in October and November to celebrate ribbons are out of the box and I can hardly put them away until the end of December. E. took some of them and started to tie them on the laundry basket which was laid sideways. She put some toys in and baby Sis was more than pleased. After having lost interest in the hanging ribbons L. started to use the basket as baby walker. She was getting familiar with word like hanging, ribbons, in, out, pull, push. I was so happy and grateful for this activity. First of all, the kids play together, second, I didn’t have to do anything to entertain them, third, they practised their English. Most of the evening routine is done in Hungarian. This is Daddy’s favourite time spent with E. that I would not like to take away from them. On the other hand I don’t want E. to miss the English vocabulary of the evening routine. 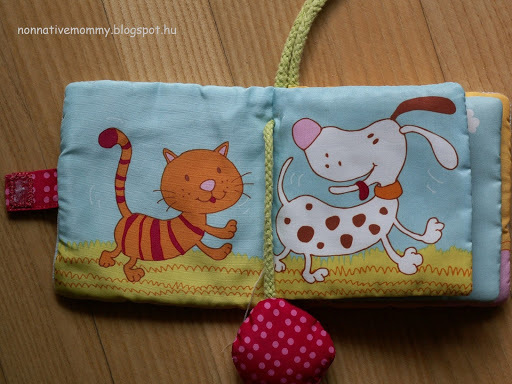 Not to mention the fact that reading bedtime stories only in Hungarian is a heartbreak for me. So every now and then (like 2-3 times a week) I try to convince my husband to turn into English. And it works brilliantly. In the meantime I do some things around the house, preparation for the feeding, E.’s room, jammies etc. 19:00 – taking the bath: E. sits in the bath and the sea creatures are jumping in one by one – the crocodile, the starfish, the octopus, the whale, the turtle, and then an extra duck, some measuring spoons of different colours, sometimes a filter and more bottle caps. So she can hardly move in the water. We usually name the animals, sometimes we attack her with the animals, and spay her with water, of course, while we comment the happenings in English. But mostly we follow what she wants to do. 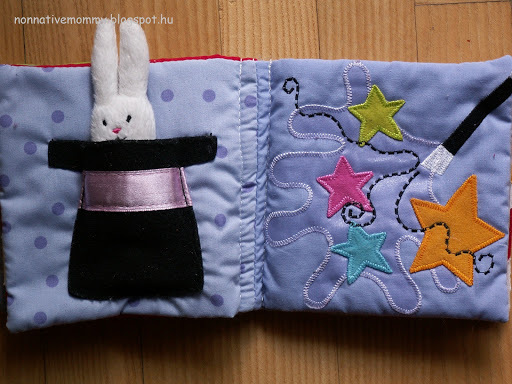 Sometime she asks for her plastic book – one is a biblical story of the lost lamb, the other is Vizipók and his friends. I tell her the Lost Lamb story in English, we talk about the pictures, and at the end I ask her to show me the shepherd, the lamb or other things in the pictures. But I’m in trouble with Vizipók as I don’t know the names in English or they sound really silly (Ormányosbogár = Snout Beetle, Keresztespók= Garden Spider) so I rather hide this booklet when we have a bath in English. 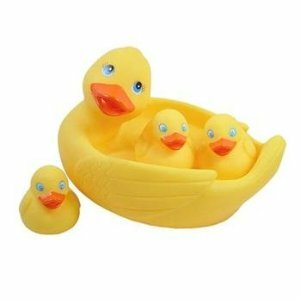 Another favourite is Mommy Duck and her ducklings. Mommy Duck can carry 3 little ducklings on her back. When we play with the ducks Mommy Duck is swimming around E. and when the ducks are behind her one of the ducklings is taken off Mommy Duck’s back (by D.). 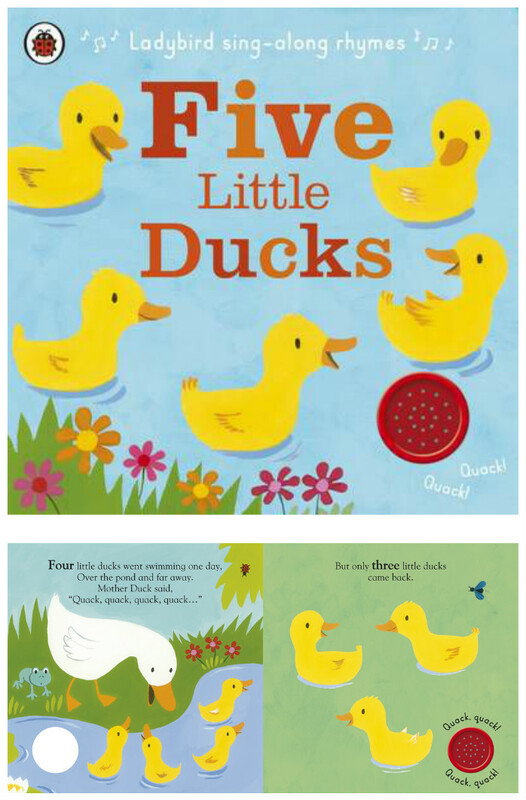 In the meantime we sing 5 Little Ducks (well, three in this version). E. is so cute as she is trying to turn back to see how the ducklings disappear, but usually she is not quick enough. Another activity is toothbrushing. E. asks for her toothbrush, then she brushes the crocodiles teeth while we are singing This is the way we brush our teeth. She also wishes to brush Daddy’s teeth or mine. Every now and then she brushes her own teeth as well. If she is not in the mood, I do it for her, which she doesn’t really like. When we are finished in the bath we say good bye to the toys. 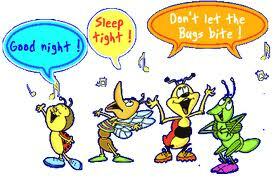 E. hands me the toys one by one and we say good night to them. If I tell her to look behind because there is one more toy, she understands it perfectly and turns around the grab the object. While we are putting the toys away she is waving good-bye. We usually play the changing table games I have already posted about. D. puts on E.’s jammies and sleeping bag. He usually sings some songs. I prepare her milk. E. turns off her light, only a bedside lamp is on. Then E. and I sit down in the rocking chair to drink her milk, and D. reads a story or two. 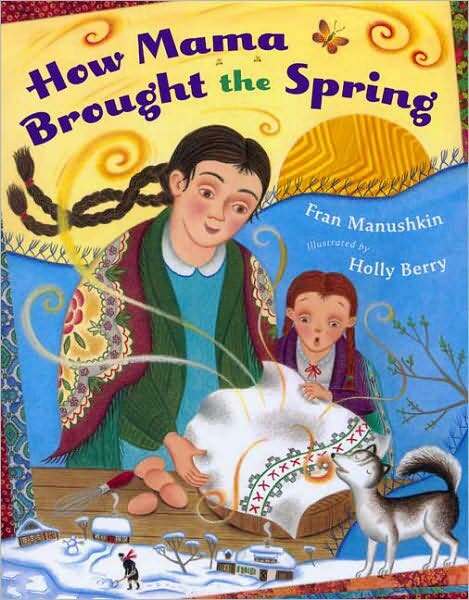 If we read in English at the moment we are reading the book: How Mama Brought the Spring by Fran Manushkin. 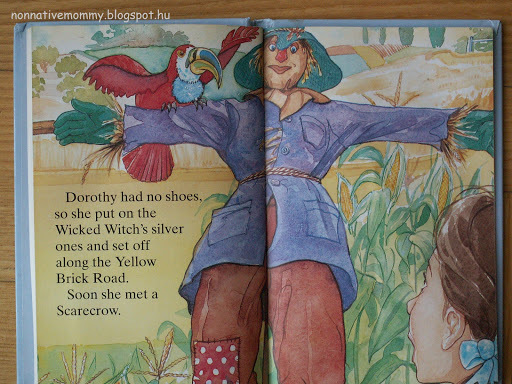 It’s for kids around the age of 5, but E. adores the pictures in the book. Before E. finishes her milk, D. says good night to her and leaves the room. Then we turn off the light and talks to the angels. I say thank you for the nice day and recall the lovely happenings of our day. 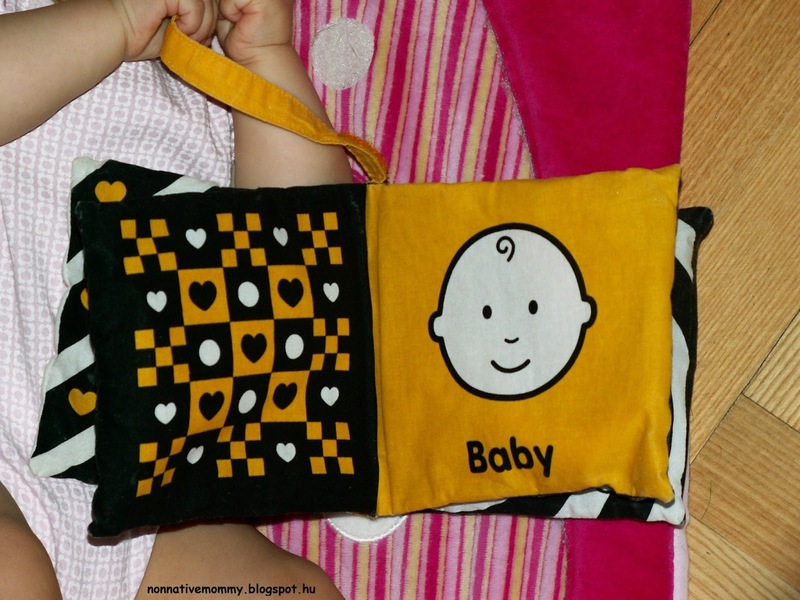 E. often repeats the words she can also say like, baby, happy, her name or grandparents’ name, Daddy, Mommy etc. SO actually she thanks for everything that happens to her. Then I put her down into her bed (she says ‘bed’) and I give her dummy (she says ‘dummy’) and I give her a textile nappy and her doggy she always sleeps with. I kiss her goodnight and leave the room. Most of the time she falls asleep within 5-10 minutes. Sometimes she chats to herself a little. If it’s an English evening she talks to herself in English. 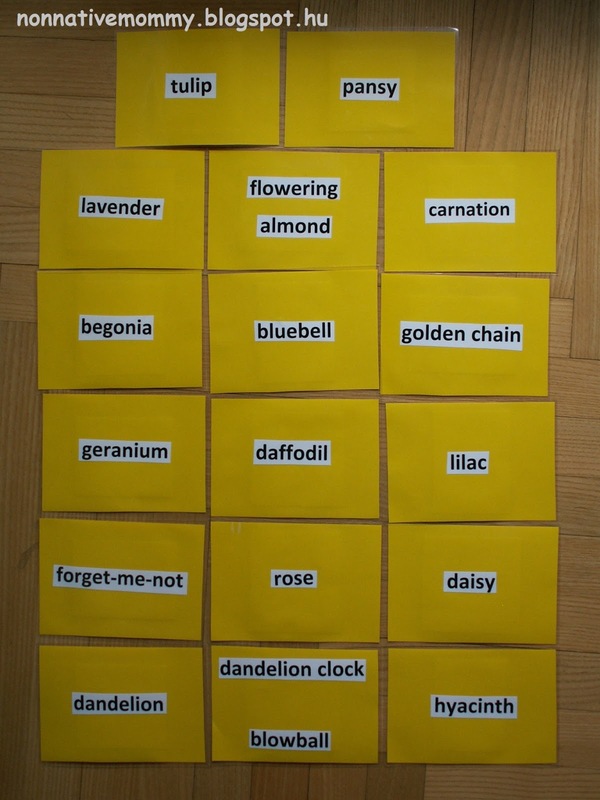 As a language teacher I used a lot of card activities with my students to explain, identify, show or play things with them. It worked even with adults, but it’s a hit with kids. They are colourful, fun to look at, nice to chew them or fold them (well, at least from E.’s point of view). You can find a lot of ready-made flashcards on the net, for example, here. You just print them and can start using them. 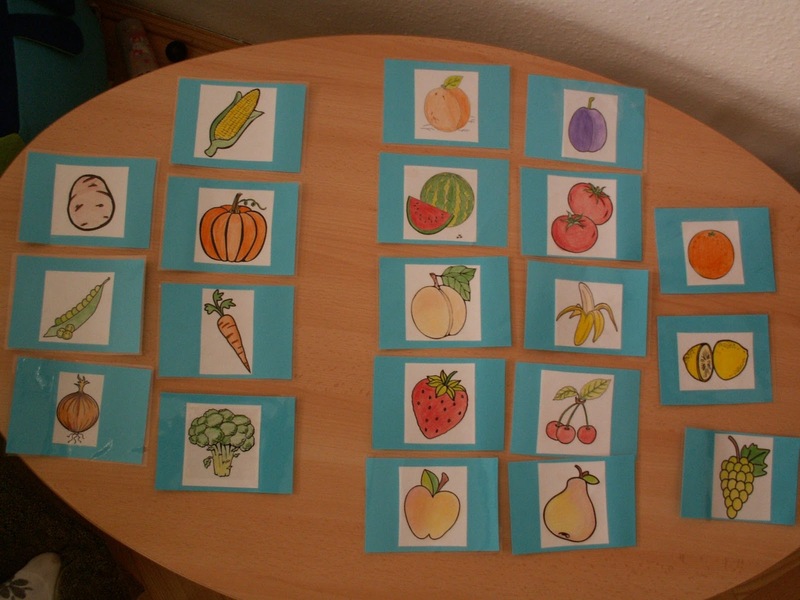 You can also find videos showing flashcards. I found them rather disappointing. A lot of them have strange visuals, or they use the American variation of the word I wouldn’t use. But the most horrible experience is when the words are pronounce by a machine. It’s scary. Plus, I don’t want to make E. sit in front of the computer a lot. I decided to make my own cards; it’s more personal in this way, and sometimes E. could see when I prepared them, and became even more interested. And we can take with us if we want. What I do is similar to the Doman technique, but maybe not so thorough. I make flashcards about the topics E. is interested in. And the way I show them to her is not so systematic and not so fast. I’m not changing the cards so often as we play a lot with them and it’s not only about showing her the cards. Sometimes I tell her a story or connect the cards to something that happened to us, or anything connected to real life. She loves those cards the most which she experienced in her own life (E.g. : body parts are great as she can identify them on me or on herself, what’s more, the cards make her interactive; she asks D. to show his belly button. Among the flowers she adores the dandelion clock as we blew a lot of them when they bloomed in the park, but there are the fruits she can touch and taste like a banana or an apple). I started with animals. As we don’t have a colour printer I found some colouring pages on the net and selected some basic (later some more) animals, printed them and coloured them myself. (Quite time-consuming). 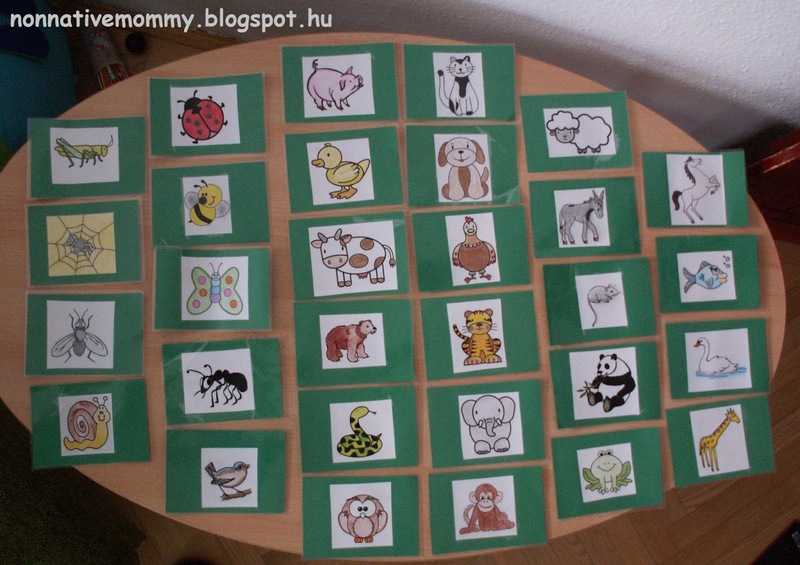 Luckily I got a laminator from D. for Christmas, so I glued the coloured animals on colour paper and laminated each. It was a great idea as at the beginning E. chewed, folded and threw them away, so they really needed to be tough. Different topics have different background colours. I thought at that time I won’t make other cards but animals since she wanted nothing else but animals. We made noises that the animals made, named their colours, stated what they like eating, where they live, or sang a song about them etc. 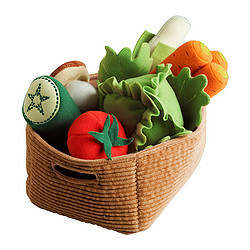 Then she got a basket of soft vegetables (from IKEA) and I was “forced” to make some vegetable cards. 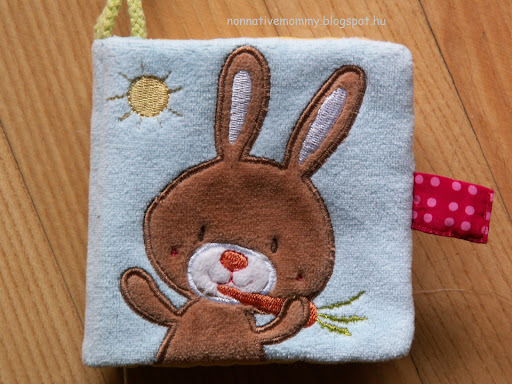 (We play matching games with the soft vegetables and the cards). The same thing happened when we bought the wooden fruit box. 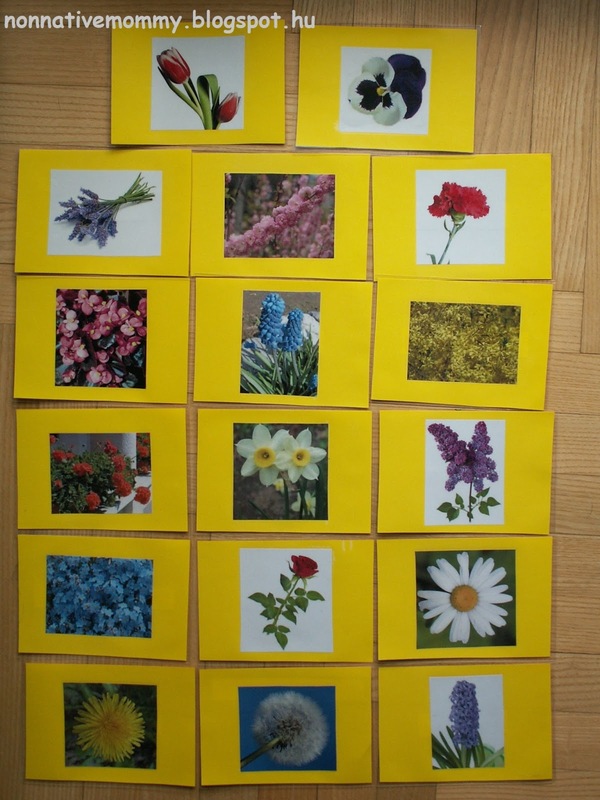 While we were walking in the park I realised we needed some flower cards, too. I just haven’t had the energy and willpower to make tree cards, but I will one day. The flower cards are more ‘professional’ as they are photos printed in colour. 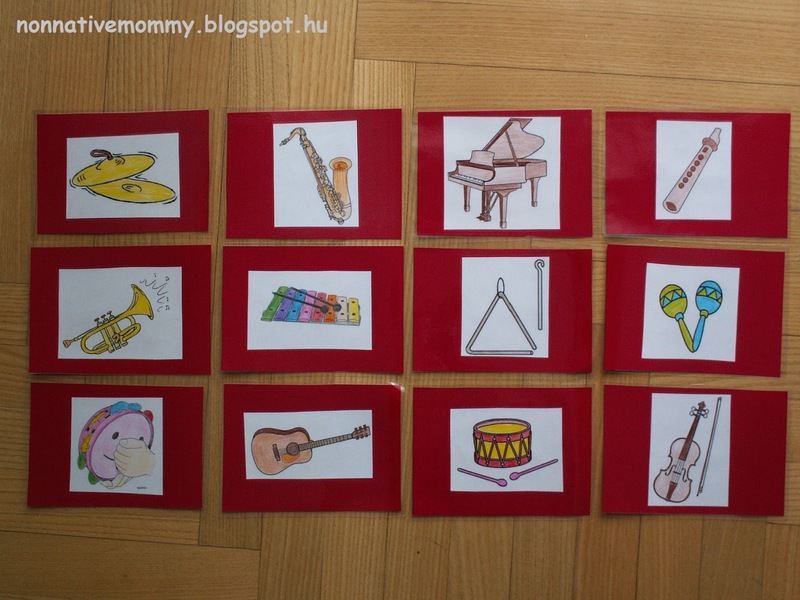 I don’t want E. to learn reading yet, so I didn’t bother making word cards connected to the pictures. Except for the flower cards. And the reason for it is that I have difficulty remembering the names of the flowers so it is also a learning process for me. The names are on the back. Sometimes she wants to look at the words, so I show her. But I’m NOT teaching her to read. Then the body parts came influenced by the Helen Doron songs and rhymes. At the moment we are looking at them when E. is sitting on the potty, as we can point at different body parts when she is half-naked (belly button is her favourite). 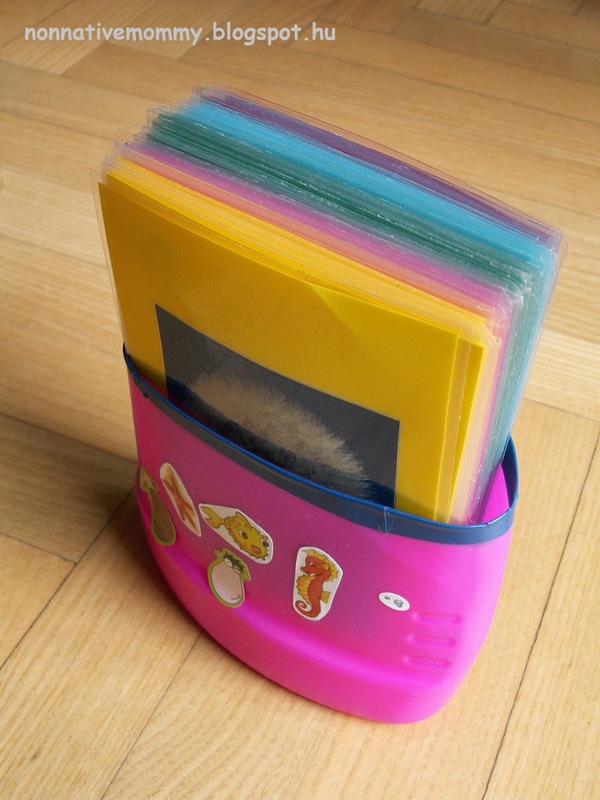 After making the body part cards, the time came when a box was necessary for keeping the cards in one place (that is next to the potty most of the time). 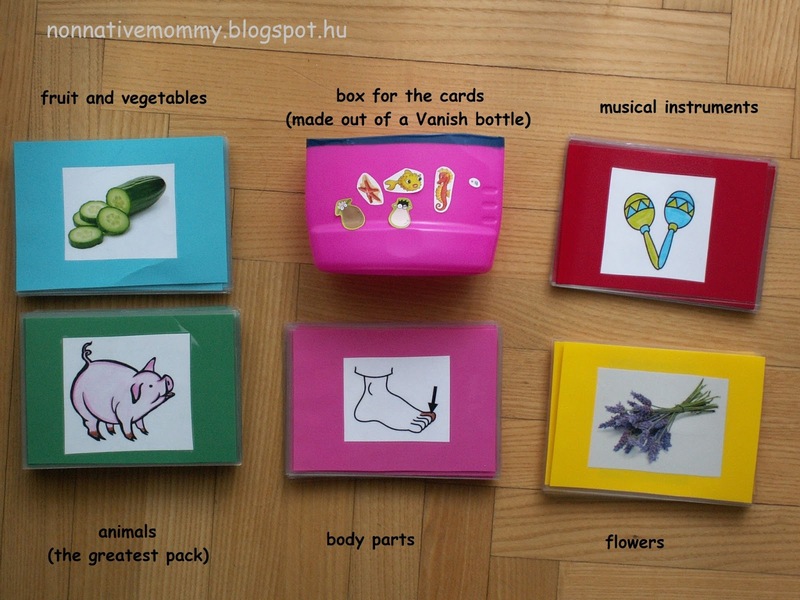 So long time ago I saw a pinterest post about how to make a box for kids out of a Vanish plastic bottle. I made it and the cards can fit in it well. 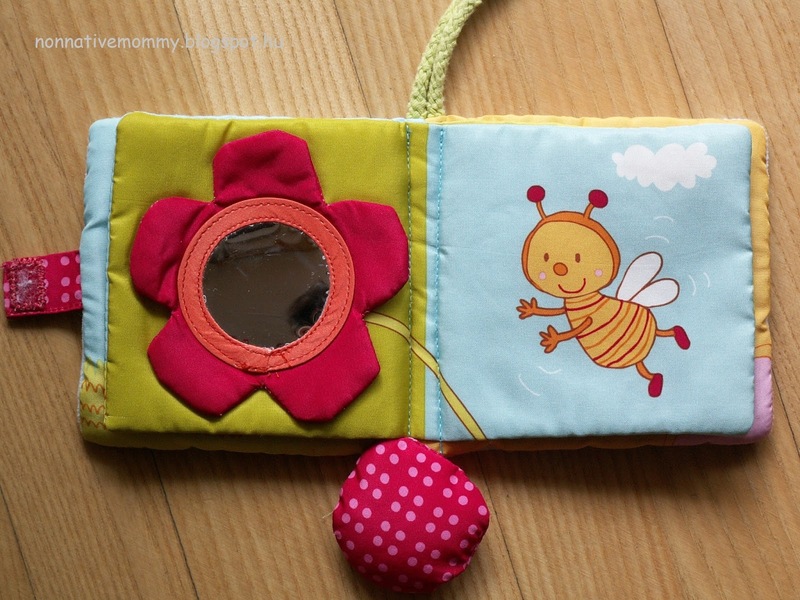 I also made musical instruments, but she has just started to become interested in them. We are going to begin using them later on. Below you can see the present collection of our cards. They are far from being ready. I’m continuously making new cards to each group. Certainly there are more groups to come (everyday objects, furniture, baby stuff, means of transport, rooms, playground toys, tools, kitchen ware etc). Let’s sum up what to play with cards? There must be much more games to play, just let your (and your child’s) imagination fly. The books you can see in the photo above are the ones that are available for E. at any time she wants them. I also have some more rhyme books, fairy tale collections and other stories in paperback format. I rather keep them away from her at present as she is living her life through experimenting (chewing, tearing, hitting, folding etc.) with everything. 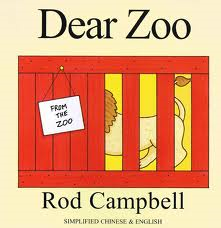 Reading out loud to your child, no matter in which language, is a must. Even at a very young age. In our case both in English and in Hungarian. I try to read it out with sound effects. 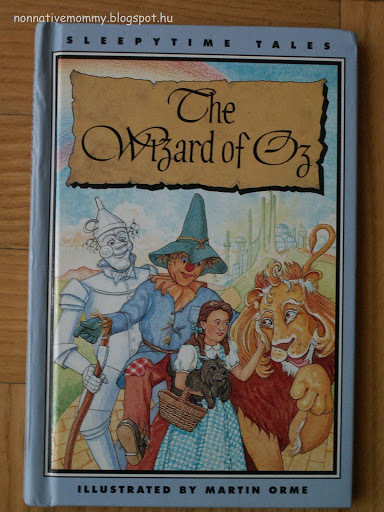 The characters have different tones of voice, when the storm is coming I say whoooosh or sssssshhhhh, when the lion appears I roar, when the wizard prepares the balloon I imitate the blowing of a balloon etc. E. really loves all the sound effects. After I have read the book, she can get it for a short while. E. tries to turn the pages (it’s not easy for her as she is used to board books) and while we are looking at the pictures I tell her what we see in a few words. Then we put the book back to its place. This is when she starts whining, sometimes crying but it’s quite easy to direct her attention to something else, luckily. 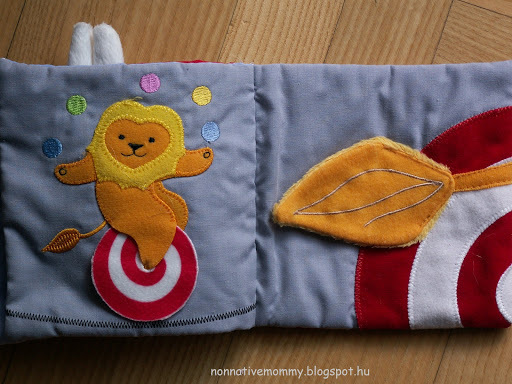 At the very beginning, from birth to 6 months I used three CLOTH BOOKS. One from IKEA, and two from DM (we got them all as presents). When she couldn’t move around too much and too fast, I just put down the book so she could see it and told a story (The Giant Elephant’s Circus, The Rabbit’s Carrot Garden, The Secret Treasure – the latter is an underwater story with sea animals, alas, I have no pics of it as it landed at one of the Grandmas). She paid really close attention. Then by the time she could touch the book, I described the sounds they made (crackle and rustle), the different surfaces they had (rough, smooth, soft). Later on I stared to name the colours, the very simple sentences got more complex, though the main story line remained the same. The first thing E. could do with her hands after grabbing an object is turning the page of these books, and after a while BOARD BOOKS. 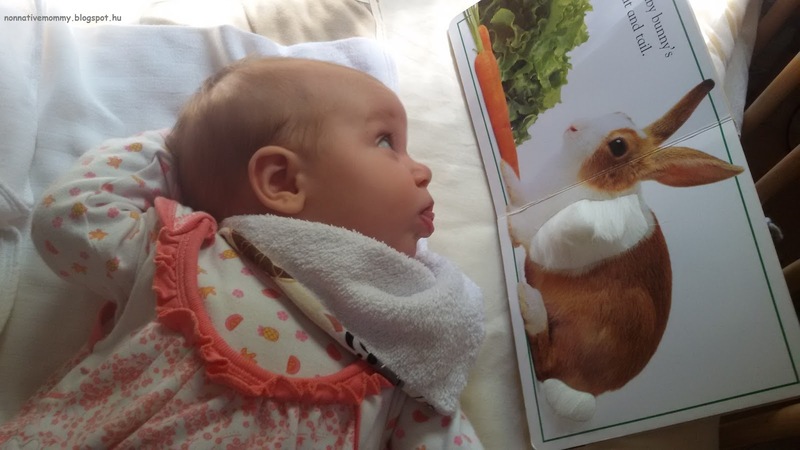 It was after the age of 6 months, but this time she was just interested in turning the pages. 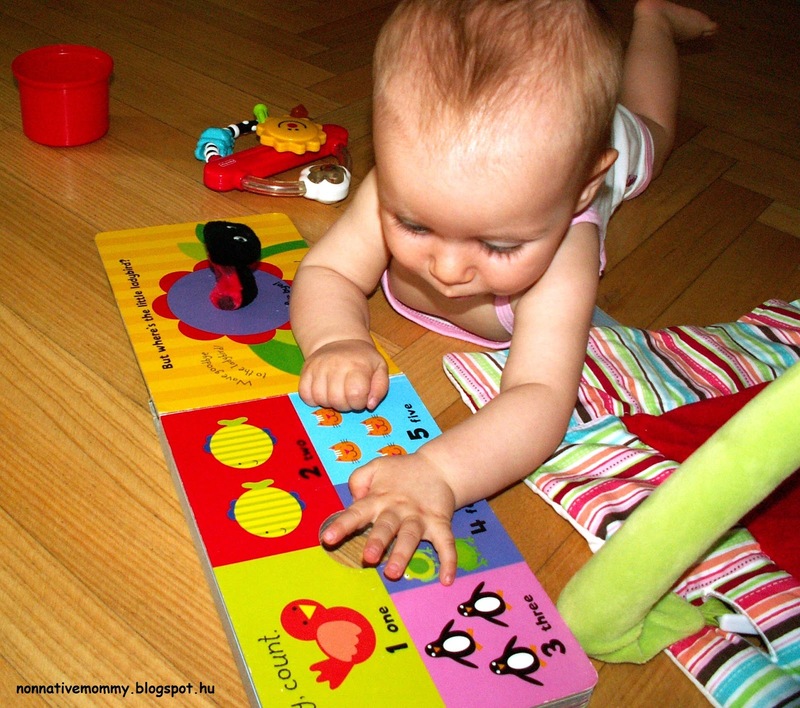 When she was around 8-9 months old she was closly examining certain pages and skipped others. 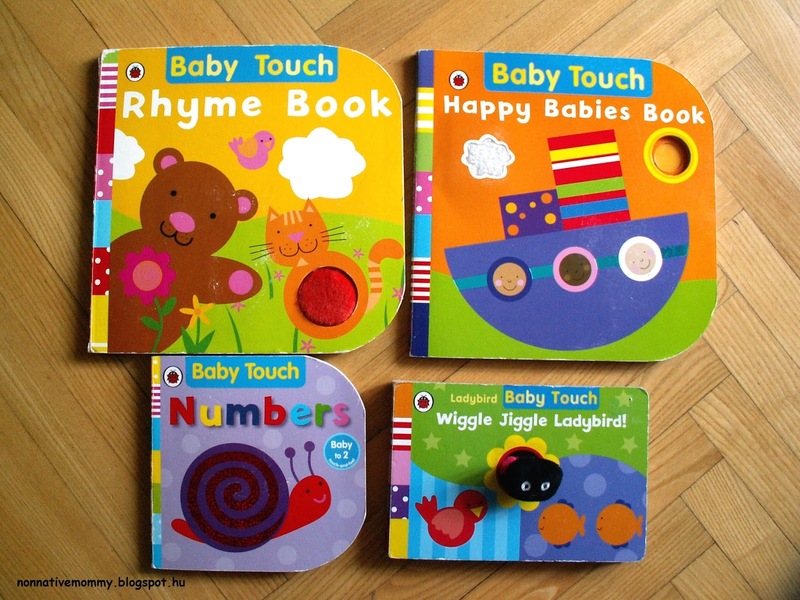 In case of the Rhyme Book, I say the rhyme or sing the song which is on the given page while E. is touching and licking the different surfaces. I often ask her questions about the pictures (Where’s the Teddy? or Are these flowers the same? What colour is the pussycat?) and then I answer them (There he is, No, they’re different, She’s orange), but nowadays she’s started to answer me babbling or pointing or even saying some wordlike utterances. 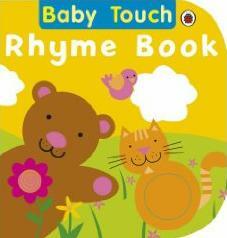 In case of the Happy Babies Book, we mostly touch and scratch, or wave hello or bye-bye to different creatures. Also, I say a lot of colours here. If I’m a little bored with it then I sing along a song which could be connected to the pictures. 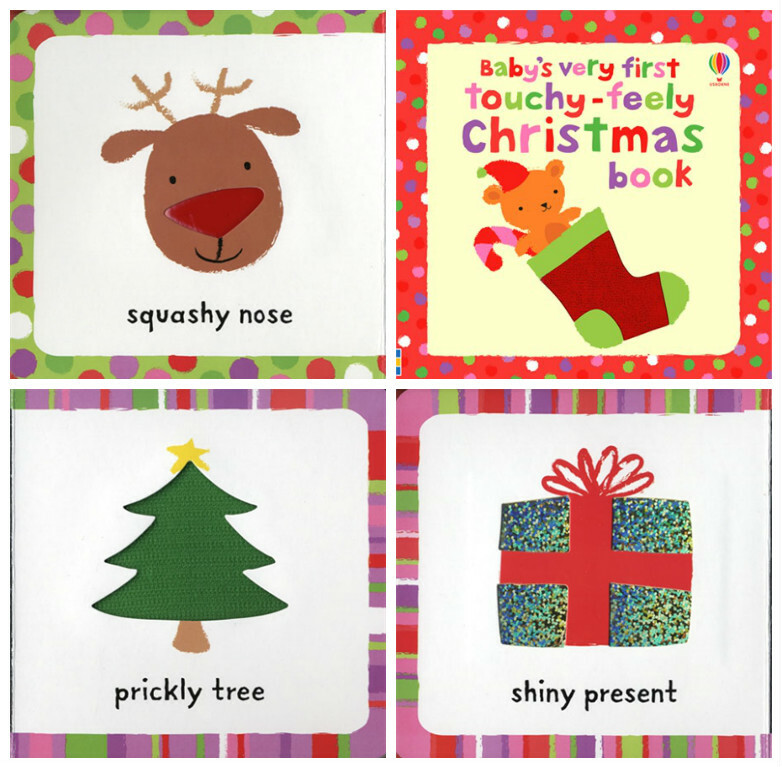 E.’s favourite page is the last one, so we just sit over it and push and lick the squishy, circle and the shiny, silver triangle. Another number 1. book with small kids is the Spot series by Eric Hill. 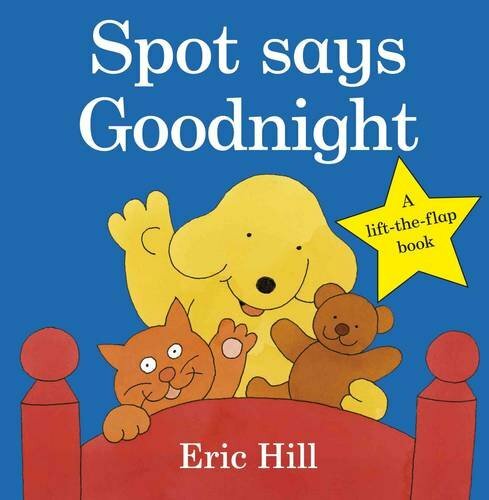 Here is a video where Eric Hill himself is reading out one of his books, Where’s Spot?. The little hands love turning the flaps (but be careful, they can tear them off in the twinkling of an eye). Spot is very well supported online as well. Have a look at Spot’s homepage. E. enjoys flap books a lot. 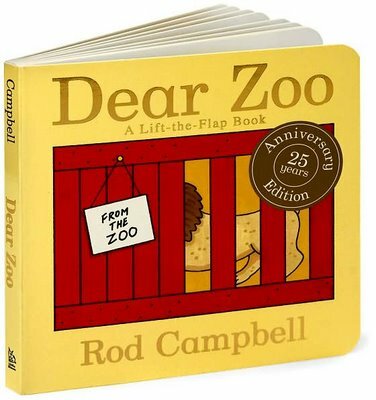 Another one in our library, which is “read” on a daily bases, is Dear Zoo. You can have a look at the inside in this funny video. 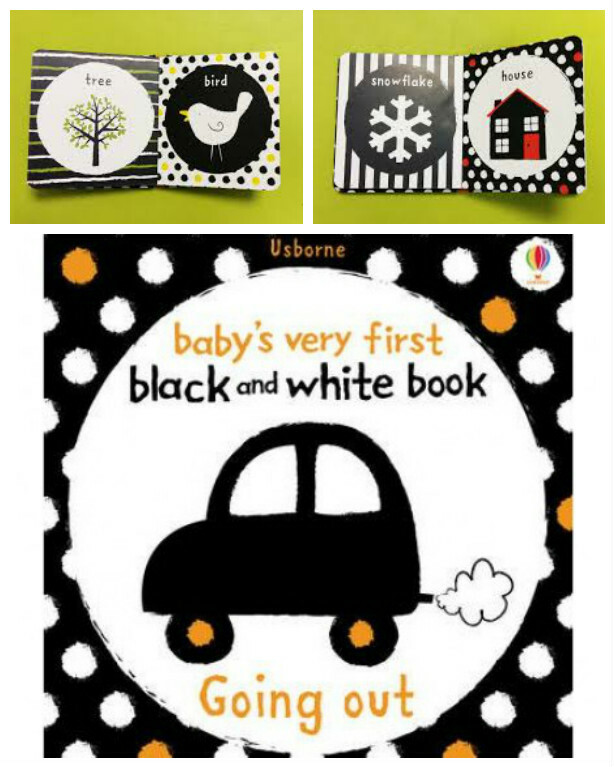 There are some educational books for early learning purposes. The market is vast for these books and there are a great number of them. 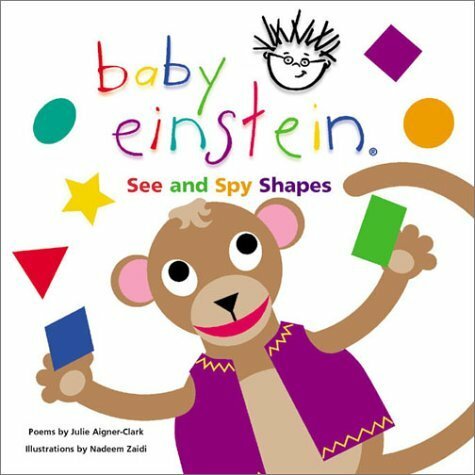 What we have are some Baby Einstein books about shapes and numbers (I managed to get 3 of them at a mom-to-mom sale in the local youth centre for a few hundred HUF). 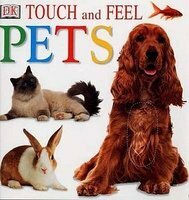 I could go on and on listing the books we love using or would love to buy but there would be no point. As far as I’ve experienced it, it doesn’t really matter what books you have, and how many you have as long as you open them regularly, on a daily bases, or as frequently as your child is interested in them. 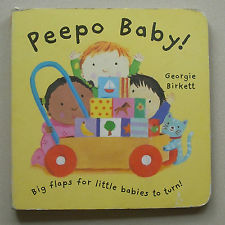 Even if you don’t have a well lined purse (well, well it’s not a surprise that these baby books cost a fortune) you can find discounts and second hand books too. There’s a site (bookdepository.com) where delivery is free. 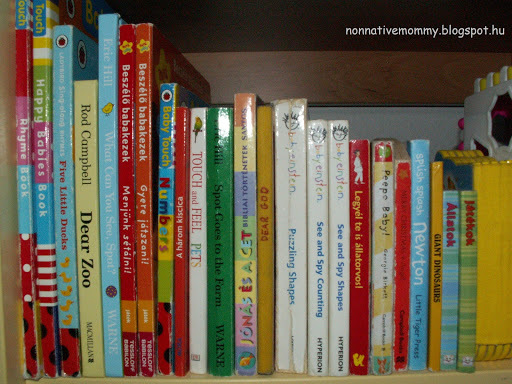 What’s more, you can read to your child online for free (though it’s not really for babies, or at least my little one doesn’t really enjoy it that much yet): wegivebooks.org . Another possibility is to make your own book, but it’ll be another post.